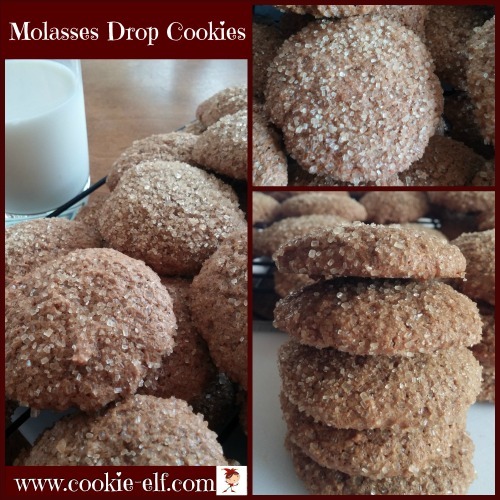 Molasses Drop Cookies are more a molded cookie than a drop cookie. The cookie dough is rolled into a ball, flattened with a drinking glass, and sprinkled with decorator sugar before baking. But the real tweak to the traditional Molasses Cookies recipe is the grated orange peel, which adds a fruity flavor to the cookies. And ... the proportions in this recipe and the additional milk also mean these cookies are soft – not crisp, like traditional ginger cookies or ginger snaps. If you prefer a crispier texture, bake these cookies 2-3 minutes longer than the recipe calls for. Preheat oven to 375ºF. Line baking sheets with silicone mats or parchment paper. In a medium bowl, combine flour, baking soda, salt, and spices. Set aside. In a separate bowl, cream together melted butter, brown sugar, and molasses until well blended. Beat in egg and orange peel. Gradually mix the flour mixture to the butter mixture, alternating with milk, until all ingredients are added and cookie dough is well blended. Shape the dough into 1-inch balls. Arrange balls on prepared baking sheets, 2 inches apart. Press each ball lightly with the bottom of a drinking glass. Sprinkle each cookie with decorator sugar or coarse sugar. Remove cookies from the oven and let them sit on the cookie sheet a few minutes. Transfer cookies to a cooling rack. Cool completely. Use a cookie scoop to measure evenly-sized cookies. Bake cookies an additional 2-3 minutes to make crispier cookies. Get more inspiration on our Drop Cookies Pinterest board. Apple Walnut Drop Cookies recipe: use just 1 apple for whole recipe!